I love to make fried seafood coated with fiery seasoning. The following prawn preparation is spicy and delicious at the same time. It is coated with flavored batter and is quickly deep fried for a nice and crunchy texture. You can make it quickly right before the party begins. One can use the same ingredients with calamari or fish fillets too. In case you're using fillets, make the batter slightly dense. I've used peanut oil for deep frying, but you can replace it with your preferred oil. It's a perfect snack for your weekend party when served with a bowl of fiery sauce or dip. So, let's prepare this spicy, crisp and scrumptious snack preparation in a few easy steps. For best results, avoid packaged Cajun seasoning. Do try this spicy and crispy deep fried prawn recipe which is coated with aromatic and fiery Cajun seasoning which gives it a hot and irresistible flavor. Wash all the deveined prawns and keep aside. Take a bowl and add refined flour, semolina, garlic powder, onion powder, paprika, ground black pepper, oregano, thyme and cumin in it. Transfer it to the grinder and pulse for a minute. Transfer it back to the bowl and add honey, sesame oil, lime juice, light soy sauce, 1 tsp peanut oil and salt in it. Mix with a large spoon and slowly add some water keeping the batter nice and thick. Add all the prawns in it and mix again to let the batter cover them well. Seal with an aluminium foil and refrigerate for about 15 minutes. Heat peanut oil in a frying pan with a heavy base on a medium flame. Deep fry all the batter-coated prawns till they turn light golden brown. Take a serving plate and arrange a bed of lettuce leaves. 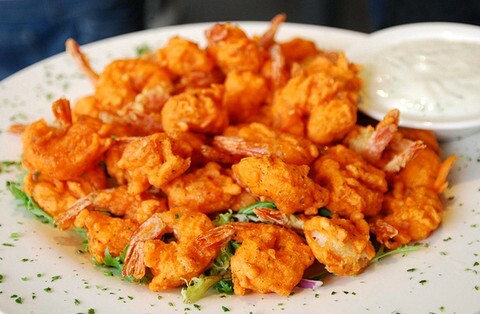 Top it with hot and crisp fried Cajun prawns. Serve immediately with a bowl of creamy dip.